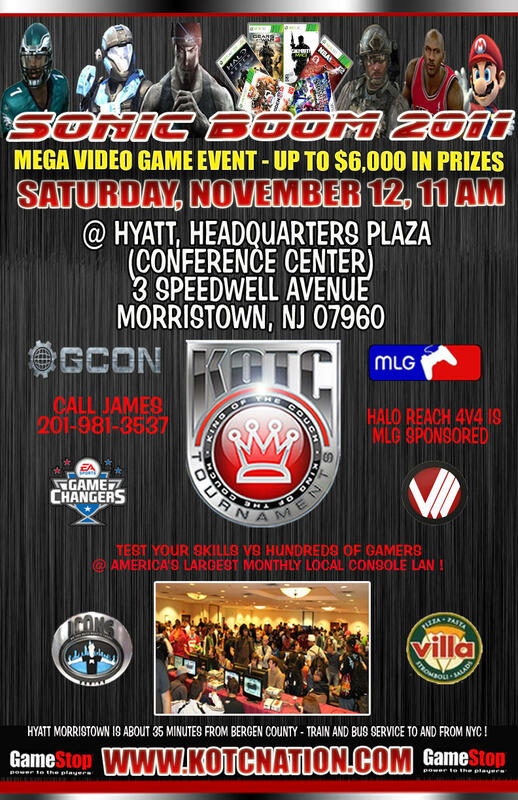 Glad to announce The Koalition will be an official media partner for the Gamestop KOTC gaming tournaments in NJ. So if you live in NY or nearby make sure you swing through to this event on Saturday November 12th from 11 am to 11pm. Thats right all day long. Summary and location of the event below. Look forward to seeing you there! Gears Of War Is Back – Modern warfare 3 Debut ! This will be one of the BIGGEST EVENTS in KOTC History ! Know people who would like to join this event? Click the Share button and invite them to come the more people only increases the payout! MLG IS SPONSORING THE HALO REACH 4v4 EVENT AND WILL BE AWARDING A TEAM PASS TO THE 4v4 WINNERS FOR MLG Providence. MLG IS SPONSORING THE COD Black Ops 4v4 EVENT AND WILL BE AWARDING A TEAM PASS TO THE 4v4 WINNERS FOR MLG Orlando. Limited PS3 to 360 converters will be available. Players please bring your own controller, PS3 or 360. The following ruleset was created by the BBR Ruleset Committee, which is made up by active, respected Tournament Organizers from around the United States. This will be considered the standard, universal ruleset for Brawl tournaments across the US. Any tournaments that do not follow this ruleset will not be eligible for stickies on SWF or featured coverage on AllisBrawl. Changes to this ruleset can be made at any time and without warning, for which we will update the version based on the significance of the change. The Ruleset Committee will pay close attention to tournament trends, and if a persistent problem presents itself, the Ruleset Committee will address the issue and adapt the ruleset as necessary. If you are interested in being admitted to the BBR-RC, send your tournament resume to AlphaZealot – you must however, have run 1 tournament with the Unity Ruleset in order to be eligible for admission. Meta Knight’s Infinite Cape Glitch and Extended Cape Glitch are banned. ers dying at the same time (either coincidentally or via suicide move) or if time ran out with both players at equal percent, a one stock three minute rematch will be played on the same stage. For a tie-breaker match, a Ledge Grab Limit of 13 is used for Meta Knight, and 18 for all other characters. In the event of a game reaching the time limit, if a single player on a team exceeds their Ledge Grab Limit, that team loses. If one or more players on both teams exceed their Ledge Grab Limit, then the Ledge Grab Limit rule is ignored. In the event of a game going to time and the Ledge Grab Limit can not determine a winner and both teams have an equal amount of combined stocks, then whichever team has a lower combined percent is declared the winner. If a player is using the character Pokemon Trainer, Lucario, or Sonic, either team may request that team colors be changed to make it easier to tell the difference between team players. The first game is played on a Stage selected from the Starter Stage List either by mutual consent or through the Stage Striking Method. The order of stage striking will be 2-3-1 (Team 1 strikes two stages, followed by Team 2 striking three stages, with Team 1 then striking one of the two remaining stages). The Team that lost the previous match announces the stage for the next match from either the Starter or the Counterpick Stage List. Any Stage named as a “Stage Ban” by the either Team may not be selected. No Stage may be used by a Team that has already won on that Stage in this set. Players may request that any texture, stage, or other hacks be disabled during a tournament set. If this is unable to be done, they may switch to a different setup if available. The BBR-RC recommends players do not use intrusive texture and stage hacks. Players are not allowed to use any game altering hacks, such as no-tripping or model hacks. If someone is caught setting up a system they brought with such hacks enabled can face punishment at the TO’s discretion. Disrupting your opponent physically or intending to disrupt their play (through something such as screaming in a player’s ear) will result in a warning. Repeated action will result in disqualification from the tournament and possibly ejection from the venue. Observers who physically disrupt players are to be dealt with as the Tournament Organiser sees fit. Disqualification is recommended if possible, and ejection from the venue is also a punishment. •The Tournament Organizer and his assistents, and any persons helping run the event may not be held liable for any lost, stolen, or damaged goods during this event. Nor will the Tournament Organizer, the venue, its owners, affiliates, employees, members, sponsors, or volunteers be held liable or responsible for any injury or harm that may befall a person during the course of this event. By entering the venue during the posted date you are displaying your agreement with this policy.